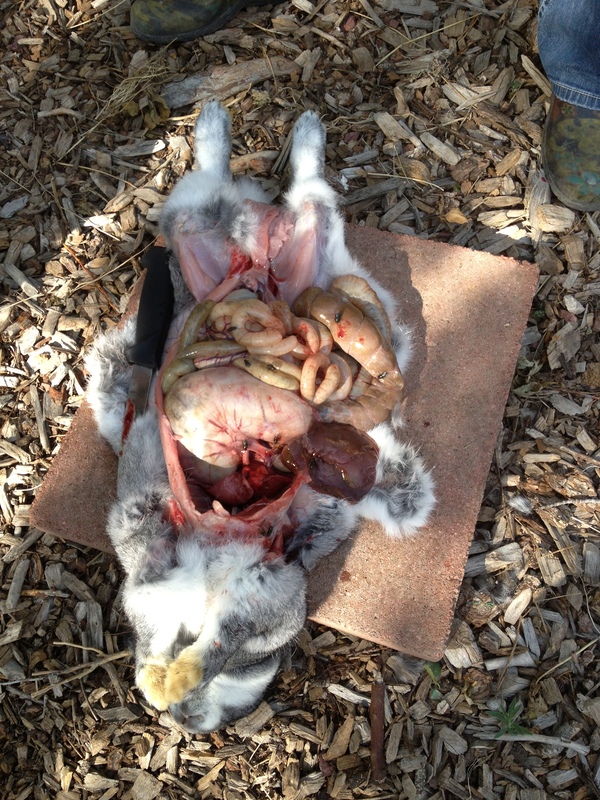 Don’t read the following information if you are queasy or aren’t in the mood to look at rabbit guts. The pictures are graphic.But you’ll learn from them. 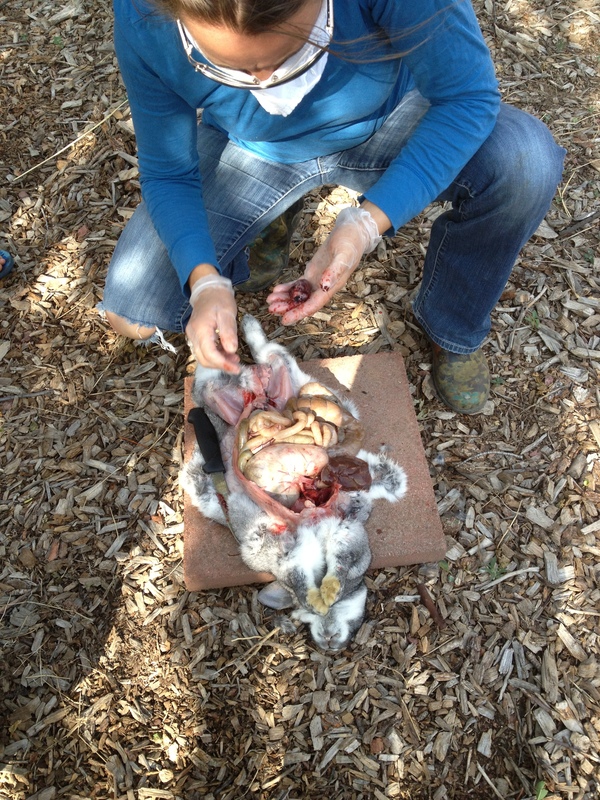 The Animal Whisperer awoke to find our big, gray rabbit dead on the floor of the barn. No apparent cause of death. He was alive and fine last night. So, I did an autopsy. The Animal Whisperer theorized it was a spider bite. I wondered if it was mouse poison. But after further discussion, we realized that he had fed the rabbit a treat of bread yesterday…so had one of our boys…so had I. That’s a lot of bread for a rabbit. Our new theory became death by bread. I’m holding the heart. It looks in good condition, not a heart attack. The muscles I can see are normal color, they don’t appear to have been discolored by a spider or snake bite. The teeth don’t have evidence of the bright tourquoisy-green mouse poison. 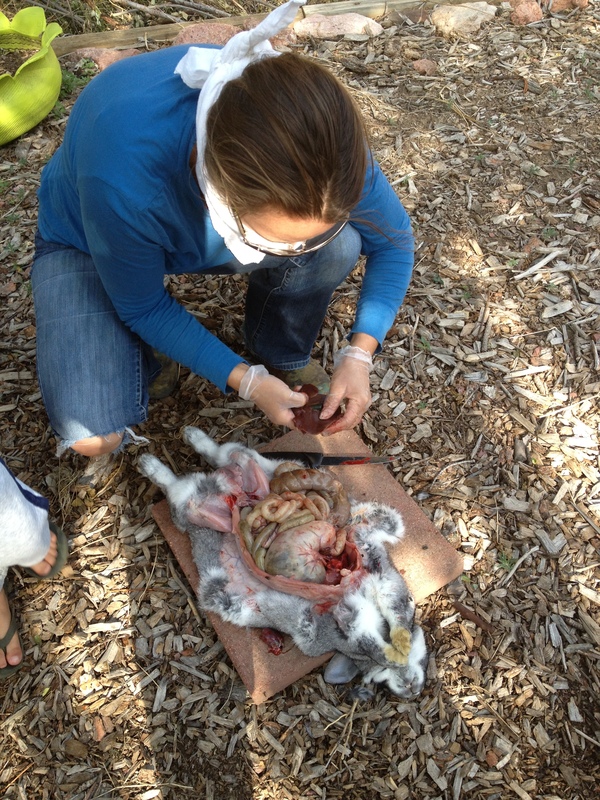 For the record: I have never done an official farm autopsy before. But I did determine that a chicken I slaughtered last year never grew to full size because it had fluid in the sack around its heart. The liver (in my hands above) was in good condition too, the gall bladder looked normal. The kidneys and lungs looked fine too. But…look at the stomach (the big whitish bag looking thing). And the large intestine (the fat snake-like tube with two flies on it at the right). They are HUGE. The Animal Whisperer does all the rabbit slaughtering around here, so I’ve never seen the insides of a rabbit, but this just doesn’t look right. Soon after the above picture, I cut into the stomach and large intestine. Out POURED (smelly) greenish lumpy stuff, the consistency of thick split pea soup. And, the jam packed nature of the stomach and large intestine stopped at the connection to the small intestine, which then became a long, skinny tube of mostly air. I didn’t look carefully enough to notice if the large intestine was twisted at the connection to the small intestine, but it was obviously blocked by SO MUCH FOOD. Apparently, this rabbit had loved the bread we gave him. He appeared to have eaten it all. We learned our lesson, we must be careful to not overfeed the rabbits. They cannot throw up. So, even if he could tell he was full, he couldn’t get rid of the food. Death by intestinal blockage caused by overeating. We are sorry Mr. Rabbit. We hope you are hopping in a meadow somewhere in rabbit heaven. This entry was posted in Experiments, Farm Life, Opinion and tagged Animals, autopsy, barn, doctors, Farm Life, health care, unhealthy. Bookmark the permalink. 11 Responses to Unfortunately, Rabbits Can’t Throw Up. Just happened upon here again and wondered if this might be the cause for the decline in our wild bunny population since we often find them dead of no apparent reason. Organic control. I will bait under the garden boxes with bread and cabbage leaves. I doubt its any more painful or inhumane than mouse or gopher poison is. They obviously are stealing enough from the goats and chickens to make themselves sick. Thanks, just a tip you might pass on. People use Bazooka bubble gum for gophers too same reason…. Last year my daughter went to Sitka, Alaska for 6 weeks to visit with friends. That left me with the job of taking care of her pet rabbit, Carl. I took great care to keep him cool during our extremely hot month of July in Kansas. You guys in Colorado have no idea of how hot it is in Kansas in July and August. As the saying goes, it’s not the heat, it’s the humidity. Anyway, all is going great until I notice Carl is just sitting there, not wanting to move. And he’s looking a whole lot rounder than usual. He doesn’t like it when I pet him, but now he’s not moving at all when I pet him. OK. Now I know he’s definitely NOT feeling good! He’s not dying on MY watch, so I hauled him 30 miles to a “rabbit vet”. No local vet here knows anything about them. The vet checks him out and said that he’s got a gas build-up. Rabbits can’t throw up, and they also can’t pass gas. Well, why does he have gas?? She asked if we fed him cabbage. I said we might have given him a leaf. She said that rabbits can’t have cabbage because it gives them gas. Who knew?? I had to give him about 4 different medicines, PLUS make AND give him fresh pineapple juice every 2 hours. Couldn’t be store bought – had to be FRESH. She said the prognosis wasn’t too good, but to give it a try. After 3 days of medicine and $100, he was good as new. I’m still not sure if rabbits can or can’t have cabbage, but I’m not taking any chances!!! He gets carrot peelings and kale for treats – nothing else!! thank you for the guts to do an autopsy. I have rabbits, too, and these days I would never risk feeding them bread. Why? Because I KNOW that feeding just a little too much bread to goats can kill them. Your bunny’s death may have more to do with how quickly yeast-bread was introduced to him. . . . and surely quantity on any given day is an issue. Don’t know, but perhaps the actual mode of death was the yeast growing inside him and and getting out of hand (??). . . . yeast definitely causes a lot of problems for a number of people. Good job, Lindsey. It pays to know, even if the lesson is gross. Sorry about your rabbit. HI lindsay… Thank you for this post! I, too, feed my rabbits bread, but have observed how they prefer bread to any other treat of parsley, dandelion, prickly lettuce and certainly more than the pellets. So I have been cutting back on the bread and give them a 1″ to 2″ square (depending on how much else is going to them…) This was a heartbreak too for your family… love my bunnies and I have seen your beautiful gray rabbit… Sorry, friend. Thanks for sharing your life with us! Never knew rabbits could eat bread and I am not going to try! !